I was not aware of any legal changes to the rules of entry into the United States via seeking asylum, but apparently the age old protocols are now being replaced at the San Diego POEs with a denial to proceed to asylum seekers. It is unclear if actual and lawful changes have been secretly signed, sealed and delivered to the Agents who are denying entry to asylum seekers, or if this is some type of rogue intervention on the part of these Agents who obviously are true believers of Donald Trump. Here you can look over all of the reports from Citizen Lab going back to last February; within this report are links to "Reckless Redux : Senior Mexican Legislators and Politicians Targeted With NSO Spyware" and "Reckless Exploit: Mexican Journalists, Lawyers, and a Child Targeted with NSO Spyware". Additionally, all reports from the New York Times (2), Forbes, Associated Press, BBC, Foreign Policy, Reuters, UPI, AFP, Fortune, Televisa, and El Universal are linked at the bottom of the page. I believe since this was published, there has been another opinion piece from the New York Times which Zeta picked up a few days back - I'll try to find that one tonight. 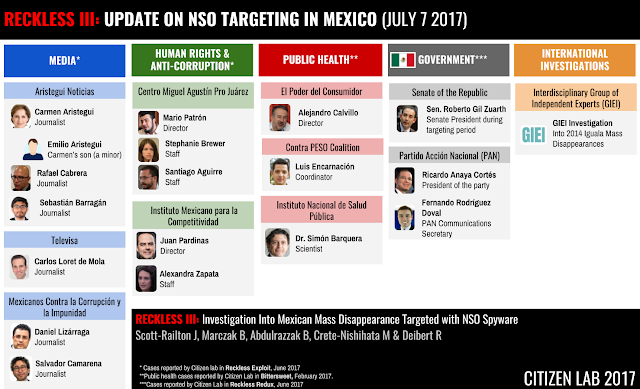 edit: correction, the editorial from the New York Times covered by Zeta (07/11/17: Que EPN "sea sincero" y Acepte Ayuda Extranjera Para Investigar "abuso" del Uso de Pegasus Para espiar:NYT" ) is included in the "Reckless III" report. Of course, don't forget two years ago, the adventures of The Hacking Team in Tijuana. We are in a whirlwind of executions, over 1,000 people assassinated in Baja California since the beginning of the year. I'll be back with those updates.